In the light of the global economic downturn which has adversely affected many economies and industries, the publishing industry has found no escape. Major international publications have closed within the past year, each of which fell victim to the major slump in advertising and retail sales. However, despite these challenges Maco Caribbean Living magazine has managed to weather the storm and is celebrating its 10th year of publishing with a special anniversary collector's issue of its flagship publication. The company's Managing Director Neysha Soodeen is ecstatic about progress in the past decade, as well as the growth of Caribbean publishers who continue to bring validation to the innovation, dynamism, and creativity of that which is Caribbean. She said: "Ten years ago, there were no magazines showcasing the way we live - our architecture, diversity, colours and cuisine. With MACO, our aim was primarily to make our Caribbean people proud of who we are. I felt we were emulating everything 'foreign' without a real appreciation of our own uniqueness. My wish was to showcase the richness of the Caribbean to the world." Soodeen said that while living abroad, it became evident how very limited the perception was of the Caribbean region. "With MACO Caribbean Living, we are able to show the beauty and distinctiveness of our people and the way we live. What has also been pleasing to me is to see other empowered female publishers make their mark within the industry, attracting diverse audiences internationally." It is Soodeen's belief that competition is the mother of innovation and that publishers should work together in such fora as the Caribbean Publishers Network (CAPNET) to ensure the viability of the industry and the voice of the Caribbean. What's so special about the 10th anniversary edition? For starters, Soodeen said the design is more contemporary, more of a 'coffee table book' than the normal MACO presentation. She disclosed that Marie France Aqui, the magazine's creative director, had changed the look of this issue significantly. The magazine is printed on a matte stock compared with the glossy paper used over the past 10 years. 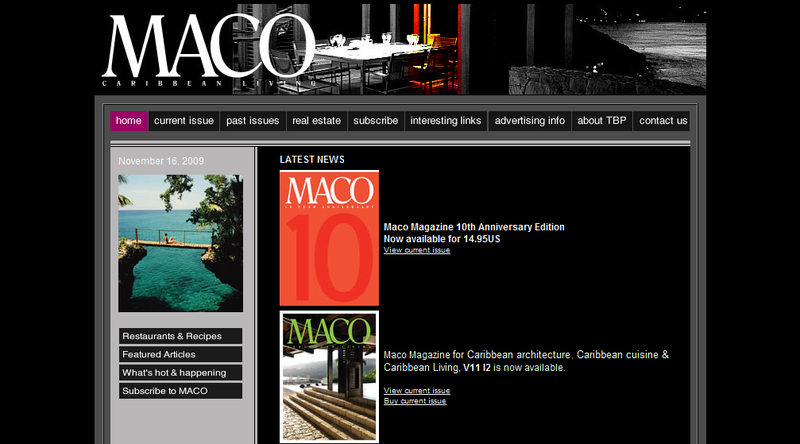 Soodeen said this may very well constitute the new look for the next 10 years of MACO Caribbean Living. Managing Editor of the magazine Helen Pipins observes that the 10th anniversary issue takes a retrospective look at the homes, food, artists, gardens and travel from previous issues, and has also included four new magnificent iconic features in the architectural, art, food and travel sections. "We have given our readers a bang for their buck. These features pay tribute to some spectacular people who have taken Caribbean art, travel and cuisine to levels which demand respect within their respective fields," Pipins added. Looking ahead, Soodeen said the future of print internationally sometimes looks daunting as the internet was providing readers with instant information and gratification. However, their readers still desire that 'feel good' aspect of a magazine which cannot be derived from a computer screen. "Despite consumers cutting back on non-essential items, the need for a feel good factor is ever more important and as a result, we have not seen a decline of retail sales. As more and more magazines disappear, MACO will also gain greater market share not only on retail shelves but with advertisers. I therefore feel confident that Toute Bagai Publishing will survive these trying economic times with the commitment from our 'Macoians'." As the Caribbean continues to flourish, there is so much more to share with the world as Toute Bagai Publications continues to be the resource for everything Caribbean, Soodeen noted.